Amidst the pedestrian-friendly maze of leafy streets in New York City’s West Village, LOT-EK, a firm whose designs focus on the creative reuse of industrial materials, inserted a gut-renovated and intensely colorful new home—getting a facade embedded with truck beds past the heritage commission along the way. Lawrence Weiner sits at his daylit desk. 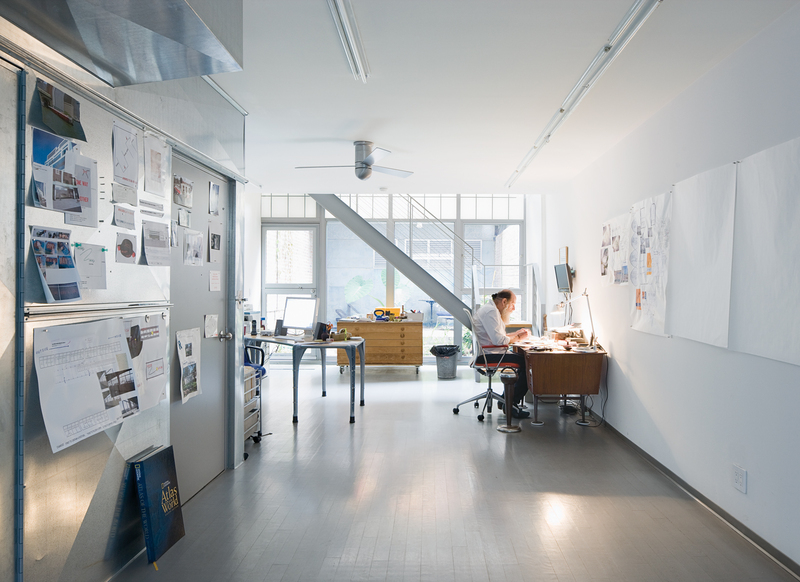 The bare walls are perfect for tacking up new projects, and the steel ductwork gives the space an industrious feel. Even with the reused truck bodies creating large windows in the facade, the house still cuts a trim figure on the street. The rooftop garden is hidden from the sidewalk. Lawrence and Alice confer in the ground-floor kitchen. Traces of color are visible everywhere, including the orange-and-yellow curtains and pink coathooks. The Weiners sit in one of the many large window bays, showing how the reused truck bodies look from within. 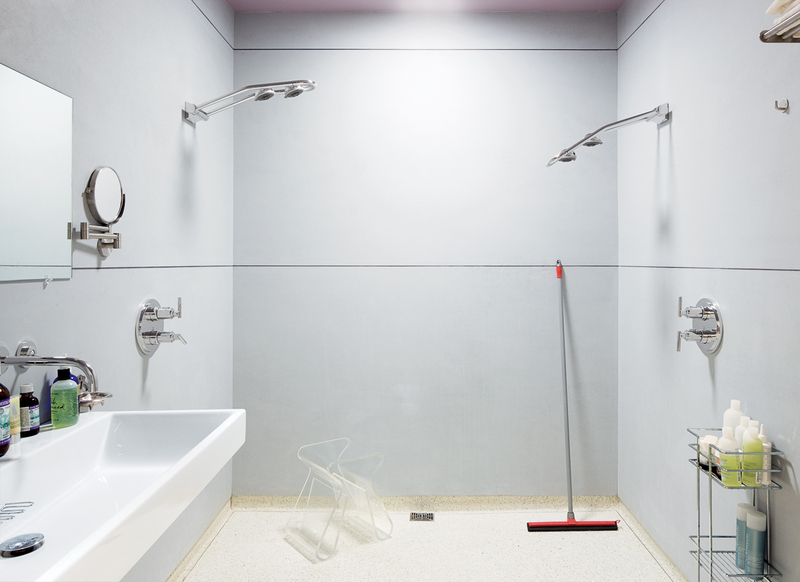 The huge master bathroom includes a fully accessible walk-in shower. The back garden includes fragments of stone from the earlier building. A collection of objects from Lawrence’s desk include stencils, paint rags, glasses, and a notebook. Pieces from Lawrence’s voluminous archive act like unintentional architectural ornaments, bringing color and humanity to the often Spartan LOT-EK design. The couple’s archival photographer Alyssa Gorelick sits in front of Lawrence’s sliding red storage units while Alice reviews some papers in the background. Lawrence relaxes in the master bedroom with a hand-rolled cigarette. The room has a lavender ceiling (Alice was told it’s the best color to see when waking). The Weiners’ first stab at a decorative green roof went awry when workers installed the fabric membrane incorrectly; the plants didn’t thrive, and soil leached down the drain, causing a backup in the yard below. But with the help of an artist friend—–and avid gardener—–they successfully brought a piece of cultivated wildness, including hardy flora like creeping thyme, honeysuckle, hops, and kiwi, to their roof. A garden path in the backyard was paved with discarded marble windowsills and stone doorframes. This reuse of ruins adds texture to the landscape. The entire house is marked by dramatic changes in color: Though the walls are white, the floors and ceiling swap tones, and pink fluorescent lights give way to a lavender bedroom ceiling. The domestic spectrum culminates in the orange floor and curtains of the rooftop penthouse—–proving that even diamond-plate steel and ventilation ducts, given some Safecoat paint, can be made as colorful and warm as a kindergarten. The Weiners put Kalwall translucent panels to good use on the home’s back wall, bringing daylight in without the use of glass windows. Although Kalwall panels can look slightly institutional in cloudy light, the results are often golden, as here. Lawrence and Alice Weiner have lived in New York City for nearly half a century, but it wasn’t until 1990 that they bought their first house. Over the years, Lawrence, one of the godfathers of 20th-century conceptual art and widely known for his minimalist experiments with language, needed a bigger place to work—–and more room for his ever-expanding archive. 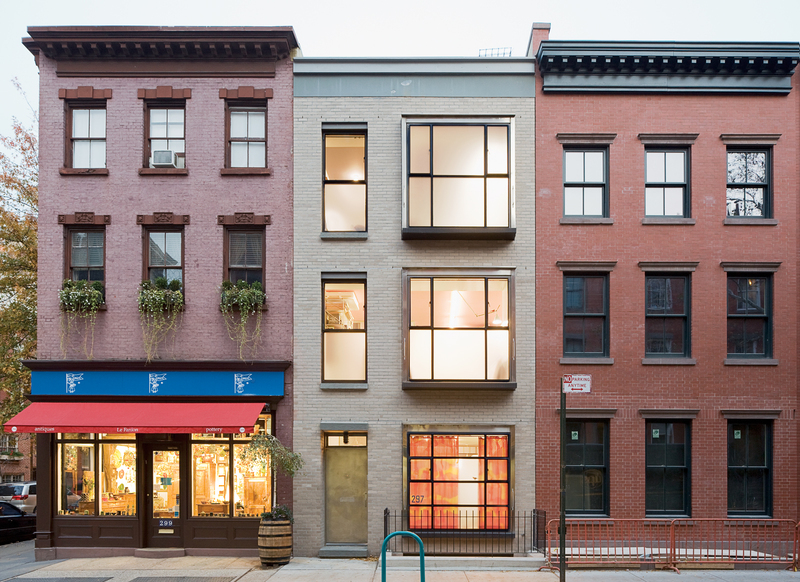 Twenty years after moving in, with a renovation wrapped up in 2009, the Weiners’ three-story house in the West Village is sublimely industrial. 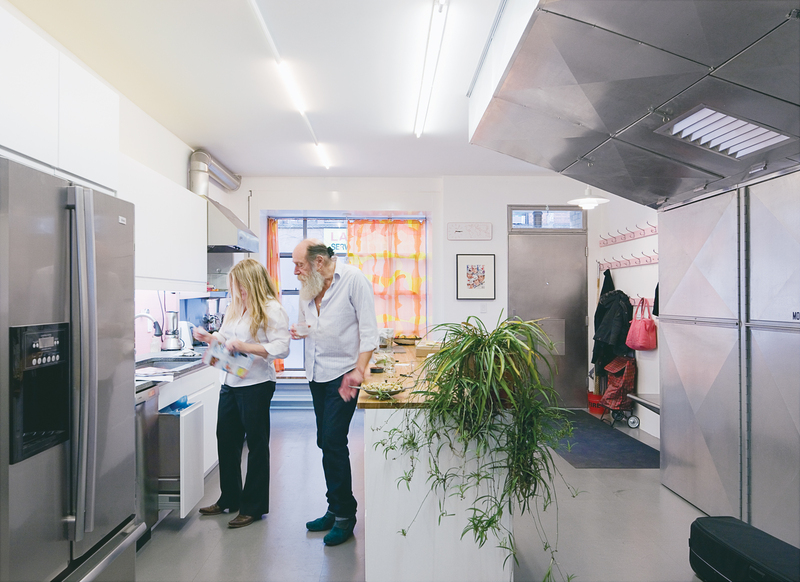 In the interest of collaboration, Alice and Lawrence talk us through their new home. Alice: We’ve always lived in New York - Lawrence in the East Village since the early 1960s. But after we were evicted in 1988, with a note left on our door at seven o’clock in the morning, I spent about eight months riding my bike around the city, looking at buildings. Lawrence would only move to the West Village, he said, and I wanted a backyard. One day I biked past a former bakery and laundromat, and it had aluminum siding. I said I would never set foot in a building like that! But our real estate agents tricked me, basically, and got me to go inside. When I went downstairs, I saw that the entire basement wall was a mirror - and Lawrence loves to work with mirrors. I thought: Maybe this isn’t so bad. So we bought it and moved in. Then two things happened: First, Mayor Giuliani changed the building codes to allow for another story, and, second, our neighbor started to build up. We didn’t want to be overshadowed - literally: Someday we knew we wanted solar panels - so we started thinking about a renovation. Lawrence: That was 2005. I met Ada [Tolla] and Giuseppe [Lignano, LOT-EK’s principals] that year at a show I was doing in Finland. Alice: And he liked them, and he liked their work. Ada and Giuseppe also lived right here in the neighborhood, so we thought that they could break through the nicey-nicey aspect of the West Village. But we don’t come from people who hire architects! That wasn’t in our background. We started off looking by word of mouth, and we looked for quite a while. We made it clear right away that we wanted a green renovation. Initially, we had architects coming through offering environmentally friendly paints and things like that - but that just felt like stuff for rich people who don’t want their children to get sick. We wanted something more. Lawrence: Ada and Giuseppe got the spatial sense well. I need a lot of light, for instance, and I seem to require outdoor spaces, both psychologically and for my work. The earlier house was a mixture of studio and home, and I wanted the same arrangement. I was working on a retrospective while they were redoing the house, so I had to move in earlier and accommodate changes in the architecture. I saw the house come together, part by part, pragmatically, whereas Alice had a more holistic view of the final building. Alice: LOT-EK was generous about letting us have what we wanted - but we were also very generous to them and open to their ideas. They had an interest in exposed industrial materials, and I actually wished that they had exposed more - like the radiant heating and the kitchen exhaust pipe - but the contractor wouldn’t do it! They used diamond-plate steel as a backsplash in the kitchen - which we painted pink - and they put untreated plywood inside the elevator. We need that for moving Lawrence’s work. Lawrence: A lot of the detailing that we pushed for had to work around the spatial idea of the architects - that’s not a bad thing, but you do have to work with someone else’s ideas. Lawrence: The trucks are almost an elegant affectation. But the great thing was Ada and Giuseppe bringing a building that had been stuck in the mud into the present day, giving it a sense of openness without it really sticking out in the neighborhood. Alice: You can miss the trucks entirely. The wall color blends in with the houses nearby, and it might be three or four times before you walk past and notice them. But this is New York; people shouldn’t expect everybody to want to look like everybody else.